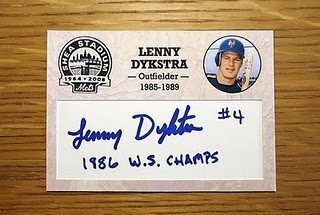 The always amazing Harvey Meiselman, our hobby’s star address list compiler, sent an update to his list purchasers of Len Dykstra’s new mailing address. The former Met and Phillie known as “Nails” is now an inmate at a California prison. I understand how set collectors collect. I understand about goals. A team collector may want EVERYONE’S signature. But, does personal admiration have anything to do with a collection? I don’t have an easy formula or litmus test. I’m unsure how to answer this question. I’ve sought some other thoughts on the subject. I found this great 2012 essay from Matt Raymond at Autograph University. I’ve never written to someone in prison. I did discover great discussions on www.sportscollectors.net. Different institutions have different rules. Most are strict about not allowing SASEs, cards or Sharpies to be mailed, let alone money. Prison websites should outline policies about writing to inmates. Readers: Are any current or former players not collectible because of their pasts? As someone working on both a 1989 and 1990 Topps set, I have run into the situation with Mel Hall. I will need to complete the set. Even if I had his address, I would have a hard time writing that letter. Not sure if going to eBay alleviates the awkward feelings.